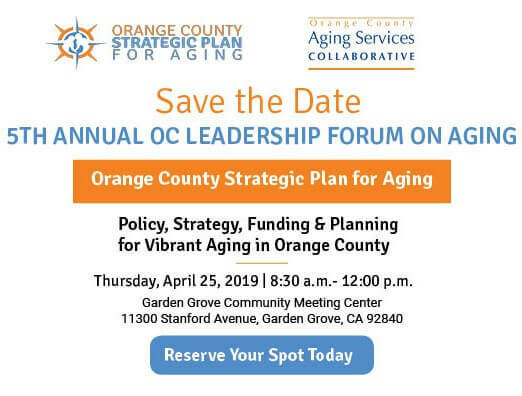 The Orange County Aging Services Collaborative brings together nonprofit and governmental senior service providers who are committed to effectively meeting the needs of our aging community through ongoing coordination. Somang Society is a Cypress-based non-profit organization. For the past ten years they have provided numerous seminars and forums in Korean and/or in English to Korean translation on aging and the end-of-life issues to educate Korean-American seniors with limited English proficiency. VA Long Beach provides comprehensive inpatient, outpatient, and extended care programs and also actively partners with universities and education centers across Southern California to fulfill the VA mission of training the newest generations of health care providers across the nation. Radiant Health Centers provides exceptional care and support to older adults living with HIV (approx 1,386 annually) along with their loved ones. They also offer comprehensive social and medical case management for people with HIV or at risk for HIV.